I appeared tonight on the Fox News Reporting special "Secrets of 9/11" to discuss the role of Anwar Awlaki in the September 11 attacks. You can find even more revelations about Americans who helped the 9/11 hijackers and Anwar Awlaki's role in my new book, Jihad Joe: Americans Who Go to War in the Name of Islam, on sale now. "Jihad Joe" also reveals the existence of other American support networks for September 11, including infrastructure created by Ali Mohamed, an American citizen and Al Qaeda spy who infiltrated the U.S. Army and played games with the CIA and FBI. You can also click here for the latest INTELWIRE coverage of Awlaki, or follow INTELWIRE on Twitter. They are Americans, and they are mujahideen. Hundreds of men from every imaginable background have walked away from the traditional American dream to volunteer for battle in the name of Islam. Some have taken part in foreign wars aligned with U.S. interests while others have carried out violence against Western interests abroad, fought the U.S. military, and even plotted terrorist attacks on American soil. "Jihad Joe: Americans Who Go to War in the Name of Islam" is the first comprehensive look at the phenomenon of American jihadists from the 1970s to the present, and looking ahead to the future, drawing on scores of interviews and thousands of pages of exclusive documents. Publishers Weekly Review: Jihad Joe is "timely and chilling"
On May 24, 2011, the Homeland Security Policy Institute will host J.M. 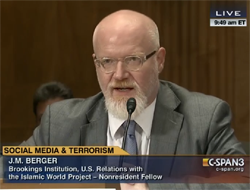 Berger for a Policy and Research Forum Event to launch and discuss "Jihad Joe" and the broader issue of American jihadists. J.M. Berger's New Book, Jihad Joe, On Sale Now!